But there’s something very unusual in between. And I don’t say that as a warning because it’s not that kind of unusual. As a composer, I’m always fascinated to hear where a famous composer “comes from,” and by that I mean how that familiar style evolved into the unmistakable voice of the mature composer. Even hearing Mozart’s earliest works, you realize the seeds of the mature Mozart’s style. But, say, in Wagner, is his early Symphony in C Major something you would expect from the composer who would later write Tristan und Isolde written about 25 years later? One thing you can say about Claude Debussy’s Piano Trio in G Major is that if you play it unannounced for your music-loving friends, chances are no one will guess who wrote it. If you’re familiar with “Clair de Lune” or La Mer, it lacks the hallmarks of what we think of as Debussy’s style. But even bold and innovative composers come from somewhere, some place where they learn their trade, to put it efficiently if not very aesthetically. This is Debussy the Teen-ager, a recording with members of the Chamber Music Society of Lincoln Center performing the four movements of his piano trio, posted at YouTube. There is one fact that you should know. In 1880, Claude Debussy the pianist was hired to be the “house pianist” for a wealthy Russian widow who was traveling through Europe with her daughters. She needed someone to give them piano lessons and to accompany her elder daughter who was a singer. Also, the mother enjoyed playing piano duets – piano, four-hands, two on a bench. The summer ended in Florence where she added a violinist and a cellist to create an in-house, private piano trio to play for her and her guests. 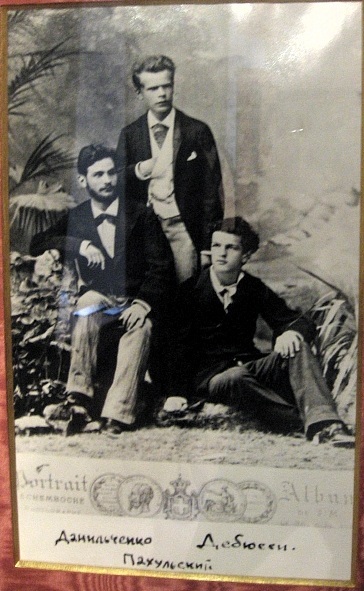 In the photograph (left), Debussy, then 18, is seated on the floor. They were expected to perform every evening, and much of their repertoire consisted of Beethoven and Schubert trios. This woman, incidentally, is well known because of her friendship and support for Peter Ilich Tchaikovsky. The one stipulation she made was that they never meet. As a result, their letters constitute a valuable document of Tchaikovsky’s creative output and personal views. Then, suddenly, in 1890, she broke off their relationship, confessing bankruptcy, though this might have been too overstated. Meanwhile, during the summers between 1880 and 1883, she employed Claude Debussy who also joined her in Russia. He himself never met Tchaikovsky but he, no doubt, heard a great deal about him and probably played a good deal of his music as Mme von Meck liked to hear her favorite music frequently and she was quite imperious about the way she handled her servants (as she viewed her musical employees) as well as her family and friends. She did, however, send Tchaikovsky a short piano piece that Debussy had composed for her that first summer, a Bohemian Dance. Tchaikovsky was not enthusiastic: "It is a very pretty piece, but it is much too short. Not a single idea is expressed fully, the form is terribly shriveled, and it lacks unity". What else Debussy may have composed for her, we don’t know. Many of these manuscripts may have disappeared into family archives, the typical boxes in the attic somewhere, yet to be unearthed. I’m not sure when this piano trio came to light: I can find no reference to a first performance. Even the first published edition doesn’t mention its publication date (see photo, below) and its first recording only came out in 1984! Now, the assumption has always been that Debussy composed this piece to play it for Mme von Meck. That would seem logical. He had played all these great trios from the classical repertoire, why wouldn’t he want to write something of his own and get it heard? If she sent Tchaikovsky this little dance, did his reaction indicate she wouldn’t waste his time sending him a large-scale work like a full-length, four-movement piano trio? What was her reaction or those of her friends who might have heard it? Did they hear it? Another interesting detail is that many sources indicate the trio was composed “c.1879” which would be a year before he was first employed by Mme von Meck. 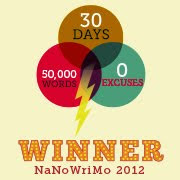 Without seeing the manuscript, I can’t say they’re wrong but it doesn’t make sense. It’s an early work – François Lesure, the man who catalogued Debussy’s music chronologically, refers to it as L.3. And he published his catalog only in 1977. Since the first published edition refers to it as L.3, that implies the publication dates between 1977 and 1984, making it a fairly recent discovery, one way or another. 1st Page of Trio "composed in 1880"
I’ll take that as more or less verification that it was, in fact, written for Mme von Meck. Besides, Debussy, at 17, was primarily aiming to become a pianist (he was hired as a pianist) and most of the early works he composed were piano pieces he could perform himself or songs friends of his would sing. Anyway, the point is – this is very young Debussy, even if there are missing works in Lesure’s catalog predating the Trio at No. 3! Does it sound like Debussy? Are there fingerprints we might hear? Probably not – they might be things he picked up imitating other composers who influenced his contemporaries like Chausson (who wrote his own Trio in 1881 at the start of his career) or Chabrier (he had not yet reached his own maturity in 1880), music that is not generally known to American audiences, these days (even Massenet is unfamiliar, though he and Saint-Saens were the leading composers of their day in France). 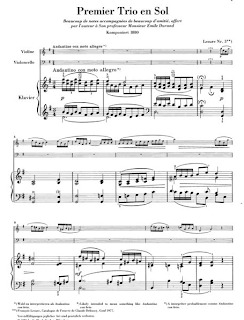 The opening of the scherzo reminds me of some of the popular dance-parodies Debussy wrote in his some of his later piano pieces, like the Children’s Corner or the Preludes for Piano. But more to my thoughts would be imagining a young Frenchman stuck in Russia and perhaps getting a chance to hear something like Mussorgsky’s Boris Godunov which certainly has considerable bearing on the opera he would started thinking about ten years later, Pelleas et Melisande. Though someone could say “perhaps he heard the historic Diaghilev production in Paris?” But that wasn’t until 1908, and Pelleas was premiered in 1902. But Boris had been performed 26 times in Russia before 1882 when it suddenly disappeared from the repertoire, not to be staged again until 1904. So… possible? It’s very likely Mme von Meck would have had a copy of the score lying around, whether she liked it or not. Again, possible… but only conjecture. After all, there are many hours in life that cannot be accounted for in those few facts available from those times. This evening, the Harrisburg Symphony presents its annual “Stuart & Friends,” chamber music with conductor Stuart Malina at the piano, with friends and colleagues from the orchestra to play, in this case, three works: Mozart’s Trio for Clarinet, Viola and Piano (with clarinetist Janine Thomas and violist Julius Wirth); Debussy’s very early Piano Trio (with violinist Nicole Diaz and cellist Daniel Pereira) and then Schubert’s “Trout” Quintet (with Diaz, Wirth, Pereira and bassist Devin Howell). The performance is at 7:30 at the Rose Lehrman Center of the Harrisburg Area Community College. Here is a wonderful performance of the entire Mozart Trio with clarinetist Martin Fröst, violist Maxim Rysanov and pianist Roland Pöntinen. It opens with an expansive andante (unusual in itself) – the Minuet begins at 5:25 and the Rondo at 10:59. Mozart’s “Kegelstatt” Trio, as it’s known, has a rather unusual combination. Traditionally, piano trios are composed for a violin, a cello and a piano which evolved from the Baroque concept of a melody instrument (could be a violin or a flute, maybe an oboe), a bass instrument (usually cello, or possibly a bassoon) and a keyboard instrument (in a secular setting, a harpsichord, most likely; in a church, an organ). And the bass instrument primarily doubled the bass-line of the keyboard part while the keyboard primarily filled in the harmonies in between bass and melody. But this particular trio doesn’t have a bass instrument and the clarinet, frankly, was not that commonly found in “classical” music situations. Most people regarded the clarinet as a kind of “dance-band” instrument for popular music (think 1780’s version of the 1940’s Big Bands) and it was only just being taken seriously by good performers who could make the case for it to be taken seriously. And generations of viola jokes aside, the viola usually got stuck filling in the harmony (along with the equally ill-suffering 2nd Fiddle) between the melody (1st Violin) and the bass line (‘cello). One of Mozart’s good friends was Anton Stadler who played in one of the Imperial “wind-bands” (called Harmoniemusik, their primary function was to play during dinners). They probably met in 1781, shortly after Mozart moved to Vienna, and it was obvious Mozart liked his playing: in addition to this particular trio, he wrote prominent wind parts in his piano concertos for Stadler and his friends to play. Eventually, Mozart would compose the Clarinet Quintet and the Clarinet Concerto for Stadler – no small endorsement of his talents! Mozart had gone to Vienna to make his fortune, so he’d hoped, and while that may not have happened in the ten years he had, there, he did make enough of a living as a piano teacher if not a composer or performer himself. The mainstay of a teacher’s livelihood, then, were the young ladies of aristocratic families who could not go on to become professional musicians as we’d think of it today, but to become more well-rounded wives to their well-to-do husbands: it was not important that she could cook or clean house or even raise the children (there were servants for that) but a pleasant voice and a reasonable ability to play the piano were highly valued not only for the family’s own musical entertainment in the days before radios, televisions and stereophonic sound systems, but also to show off for their friends and dinner guests. One of these students was Franziska von Jacquin whose father Gottfried was a friend of both Mozart’s and Stadler’s. She was in her mid-teens when Mozart wrote the piano part in this trio for her to play. Judging from that, she must certainly have been a commendable pianist! 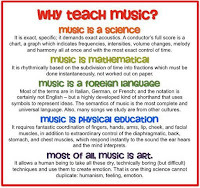 We think of composers writing all this music for us to enjoy today when, at the time, there was probably little thought to much of it beyond the initial purpose it was written for. In this case, Mozart in a relaxed mood writing for his friends and playing it for their friends and, more likely, their own amusement. Posterity was not on the radar, here. 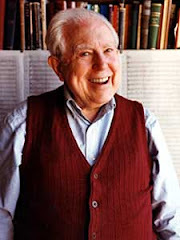 There was public music – like the symphonies, concertos and operas, and probably many of the quartets and other piano trios he composed – but this was private music or more specifically “occasional music,” written for a specific occasion. 1786 was a year Mozart often visited the Jacquin home. Gottfried was an amateur singer and composer and if Mozart didn’t actually give him lessons, he did help him with some of his songs, many of which were performed alongside Mozart’s own at these family musicales. For them, Mozart also composed a series of “part songs” (songs written for two or more voices) with accompaniments by basset horns, a kind of alto clarinet favored by Stadler and which Mozart developed a fondness for. It was for one such musicale Mozart composed this particular Trio for Clarinet, Viola and Piano – Stadler played the clarinet, Franziska the piano, and Mozart the viola (which he often preferred doing, rather than violin). Mozart had been a good enough violinist to play the violin concertos he’d written as a teen-ager, but in a string quartet, he found it more enjoyable to be sitting in the middle listening to everything going on around him. Keep in mind, in those days, if 2nd Violinists weren’t good enough to play 1st Violin parts, those who couldn’t cut 2nd Violin parts were usually handed a viola. So, every time I hear the Divertimento K.563 for string trio written two years later, there’s this wicked passage for the violinist to play which the viola then plays immediately afterwards: you can imagine the violinist sweating this technically challenging passage and then Mozart effortlessly tossing it off with a smile. Incidentally, the fact Mozart wrote it for clarinet didn’t keep the publishers from issuing it as a trio for violin (or clarinet), viola and piano. They figured there was more money to be made selling it to families with a violinist and, besides, not everybody thought the clarinet belonged in reputable situations. The other item about this trio is its nickname - Kegelstatt. Like the Haffner Serenade or the “Linz” Symphony, most people would probably assume the work was dedicated to some guy named Kegelstatt or it was written in the Town of Kegelsta[d]t.
Kegels was a popular game in Germany and all the rage in Vienna at the time, a form of “lawn bowling” in which players rolled a wooden ball down a path to knock over wooden things we would call bowling pins. It would later become a popular game in Australia – ten-pin bowling – introduced there by Germans in the 19th Century. The name has been applied to it by somebody who thought Mozart had composed this in his head while playing skittles. That’s possible though there’s no proof of it. I could imagine Mozart and his friends playing a round of skittles after dinner and performing some part songs, when Mozart said “I have this wonderful theme for a clarinet – it goes like this.” And then, as they continued to play the game, the work began to take shape in his mind. We know, from his own statements (I believe his father even mentioned it in some letters) that Mozart loved to play billiards (a more intellectually challenging game than what we simply call “pool”) and that, while sharpening his mind during a game, he would be working out certain compositional issues before putting them down on paper. 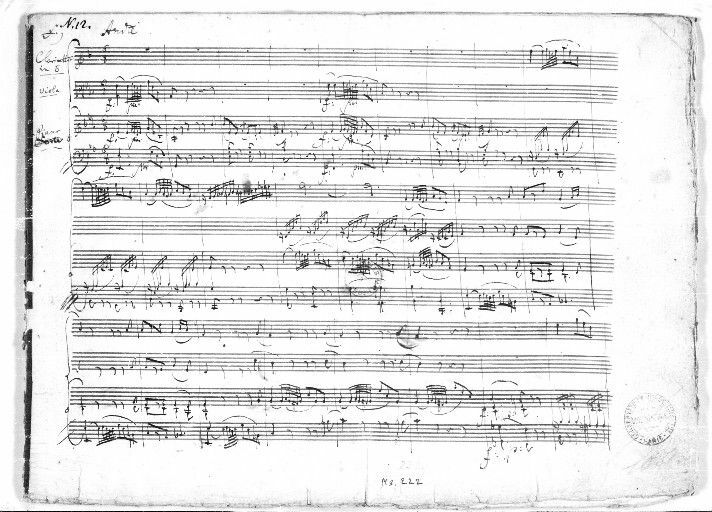 If you look at many of Mozart’s original manuscripts – not copies to be sent to the printer, but the originals – you don’t see what we’d call sketches where things are crossed out, written over or scribbled into the margins. 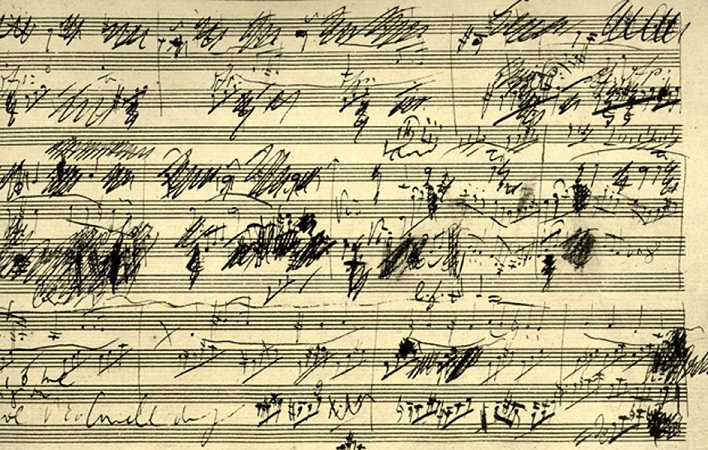 Many of Mozart’s colleagues remarked how “clean” his manuscripts are, as if they’ve sprung fully formed like Minerva from Zeus’ head (remember that famous scene in “Amadeus” where Salieri makes this discovery). 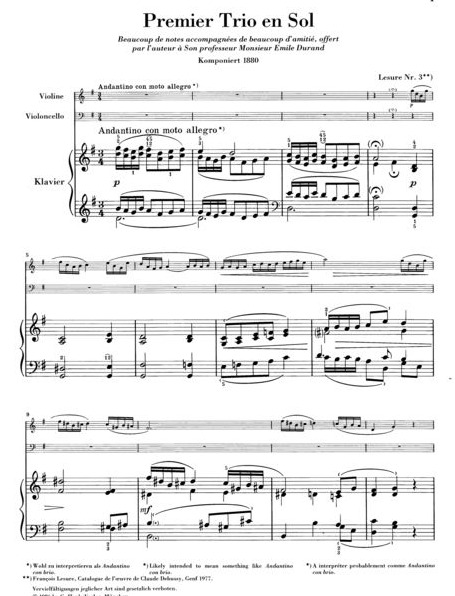 Compare the opening page of the “Kegelstatt” Trio (above), for instance, to a page from Beethoven’s Cello Sonata in A Major (below). 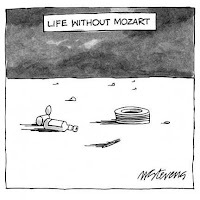 That’s not to say Mozart was a better composer than Beethoven (some would agree) – they approached it differently and Beethoven often struggled with finding the right solutions. That doesn’t mean Mozart didn’t – later, especially in the “Prussian” String Quartets, you’ll find considerable editing taking place during the creative process in the manuscripts – but if he did it in his head, who’s not going to think of the expression “divine inspiration”? Brahms had a different take on the process: he’d work things out in sketches, frequently rewrite pieces and destroy those he didn’t find suitable (by his own statements, he clearly destroyed more than he published), taking special pains to destroy all sketches and early manuscripts. Brahms said the most important possession a composer could own was a wastebasket. Mozart, it seemed, had no need of one. 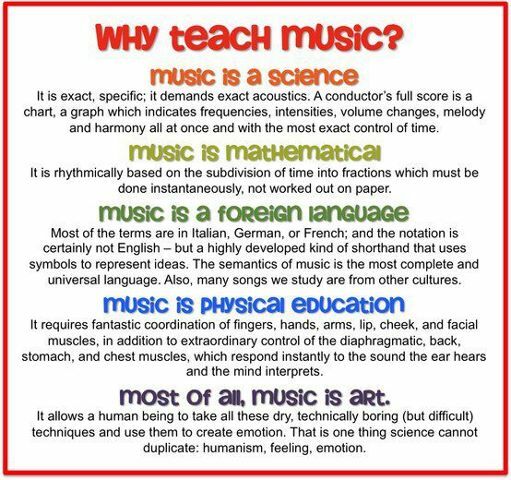 We often hear about how music (especially classical music) is elitist and exists only to entertain the well-to-do. Recently, my local newspaper published this report about the elimination of an area school district's music program. It's not just learning to play something pretty to amuse Aunt Martha when she comes over to visit. If you are a resident of Pennsylvania, please check out these links: David Dunkle's article in the Harrisburg Patriot-News (or Eleanor Chute's report in the Pittsburgh Post-Gazette - chances are it may be reported in your own local papers) and especially the full report, Creating Pennsylvania's Future Through Arts and Education available at the Education Policy and Leadership Center's website. Please consider contacting your Pennsylvania state representative and senator and ask them to consider this report seriously. Given the current attitudes about money and the budget in the state capital with this administration, it will need every bit of support to counteract the short-sited policies and attitudes of many government officials. If you live in another part of the United States but support for the arts in your state or community is fighting similar challenges, please pass this information on to anybody who might be able to spread the word! Thanks.